Get ready for our last show of the year, Just Bang 4 at Hotel Elegante Conference and Event Center. It's going down Saturday November 2, 2013 at 5:00pm. Doors open at 4pm. 13 matches, 4 of them is title bouts and 1 of those titles will go to a Jr. female for the first time at Just Bang Muay Thai. 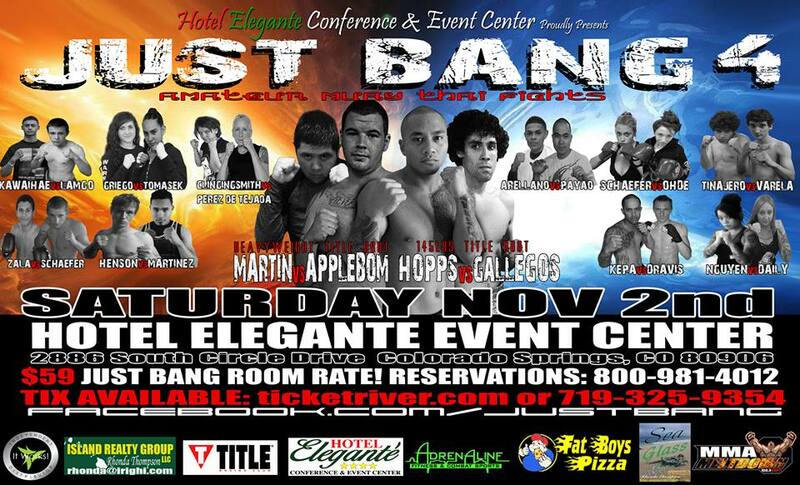 Gyms, coaches, fighters; send your stats if you want to participate on any of the Just Bang cards. No MMA or Pro fighters. ONLY Amateur fighters with no MMA fights. Looking for Sponsors to help with the Just Bang 4 Event. We have great advertisement opportunities.